In its Concluding Observations of Israel’s periodic report under the Convention on Civil and Political Rights, the Committee recognised Israel’s security concerns whilst stressing the need to observe and guarantee human rights in accordance with the Convention. The Committee expressed concern at allegations of torture, cruel, inhuman or degrading treatment of child detainees. The Committee recommended that children be given prompt access to a lawyer and all interrogations be audio-visually recorded. This report contains testimonies from former Israeli soldiers describing various aspects of the army’s military activities in the West Bank. On the topic of arrests the report states that: Over the course of the last decade, tens of thousands of Palestinians have been arrested in military operations conducted deep in Palestinian territory nearly every night. Soldiers’ testimonies reveal the methods for carrying out such arrests. 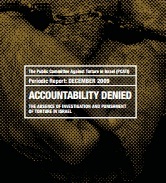 The report concludes that Israel has no genuine investigation mechanism for complaints of torture. This results in absolute criminal immunity for interrogators who commit grave crimes. In practice the system enjoys the acquiescence and encouragement of the law enforcement system for torture that occurs in GSS interrogations. Among other things, complaints are checked by an active GSS agent who is the official in charge of checking interrogee complaints. In its Concluding Observations of Israel’s periodic report under the Convention against Torture, the Committee noted that whilst there is a prevailing situation of unrest in the region under international law “no exceptional circumstances whatsoever may be invoked as a justification of torture”. In its conclusions the Committee recommended that interrogations be video recorded and that children have access to a lawyer and a family member at the outset of their detention. This report was produced by a coalition of 14 Palestinian and Israeli organizations and focuses on Israel’s compliance with its legal obligations under the UN Convention Against Torture (CAT). After considering the implementation of the Israeli Supreme Court’s torture ruling, the report focuses on a number of issues including: acts of torture and the detention of minors. This report considers evidence that the occupation of the Palestinian population has been socially, politically and morally detrimental to Israeli society has emerged. A societal 'conspiracy of silence' concerning violent encounters with Palestinian civilians is also possible. This study seeks to examine the psychological impact of the occupation on soldiers and to study post-traumatic symptomatology. This report provides a critical look at the system that has served as a cornerstone of Israeli rule in the West Bank for over 40 years. 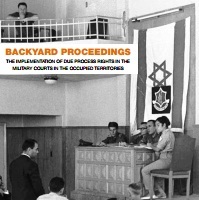 The report examines the degree to which this system upholds and implements the due process of law for Palestinian detainees and defendants brought before the Military Courts.